An API Spec 10A compliant instrument, the Model 7322 HPHT Consistometer is designed to test cement thickening behavior under a variety of downhole conditions. Designed with laboratory efficiency and ease of operation as major goals, the Model 7322 design minimized the two largest contributors to instrument downtime: the cool-down time between tests and routine maintenance. This popular model is designed for laboratories involved in: oil well cement research, development of cement additives, cement quality assurance and field laboratories. A newly designed oil pressurization system employs easy-to-maintain, aerospace-inspired modular hydraulics which also eliminate oil mist. Slurry cup drive reliability is maximized by use of a magnetic coupling system to connect the drive motor to the cup. The simple to use and reliable pressure control system consists of a pump, a sensitive pressure transducer and a unique capillary pressure release unit. The usefulness of the Model 7322 Consistometer is not limited to the standard testing of cement thickening time. 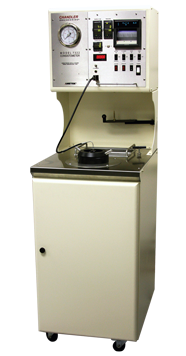 It can also be used to prepare slurries for other tests such as measuring free water content, testing for fluid loss or viscosity and consistency. The Model 7322 can be equipped with an external chiller for performing tests at sub-ambient temperatures.